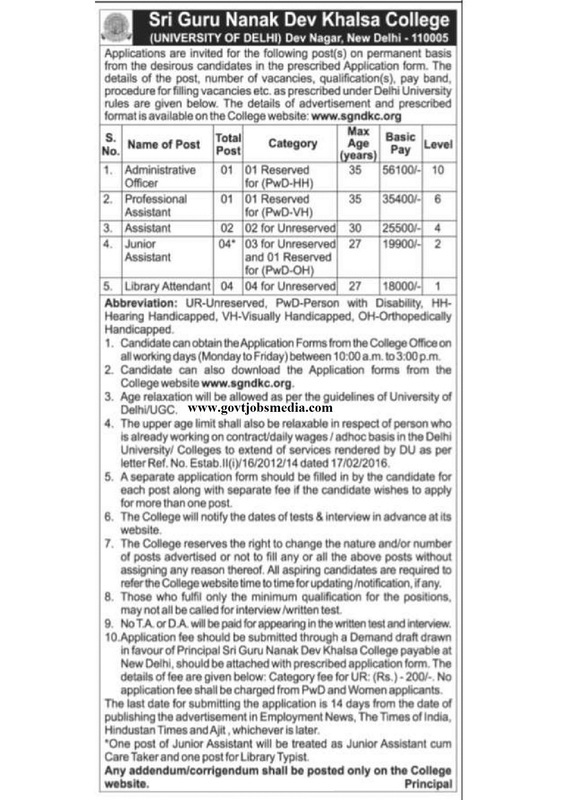 Latest Update 01/04/2019: Sri Guru Nanak Dev Khalsa College released SGNDKC Assistant Recruitment 2019 for 12 Library Attendant & Other Posts. The complete information of SGNDKC Assistant Notification 2019 is provided below clearly. Sri Guru Nanak Dev Khalsa College Recruitment 2019 is Good news for the Job Applicants, The College Officials released SGNDKC Assistant Recruitment 2019 for recruiting 12 Various Non-Teaching Vacancies. These are Administrative Officer, Professional Assistant, Assistant, Junior Assistant, Library Attendant Posts. The Organization invites SGNDKC Assistant Jobs 2019 Applications through the offline mode. The offline Applications receiving link available up to 14 Days from Date of Advertisement at Office hours 10:00 Am to 03:00 PM. So, the interested candidates hurry up and submit Application forms of SGNDKC Assistant Notification 2019 as soon as possible before the submission of the application last date. The complete information officials given in SGNDKC Notification 2019 is clearly updated through on this post. So, the interested candidates check all data on post and eligibility had candidates submit application forms. The Organization will conduct the Written Exam and Interview for the Applications submitted candidates. The 10th, 12th, Graduation, Degree passed candidates are eligible for apply SGNDKC Recruitment 2019 vacancies. The Post wise Educational information is available on the Official Advertisement. So, everyone downloads SGNDKC Jobs Official Advertisement and read clearly. Education Qualification: The 10th Class, 12th Class, Graduation passed candidates are eligible for applying. Candidates first download the Application form from the website sgndkc.org. Fill the Application form with required information. Past latest photograph and attach required documents. Attach required documents and submit the application form in College Office before the last date on Office timings at Office hours 10:00 Am to 03:00 PM.